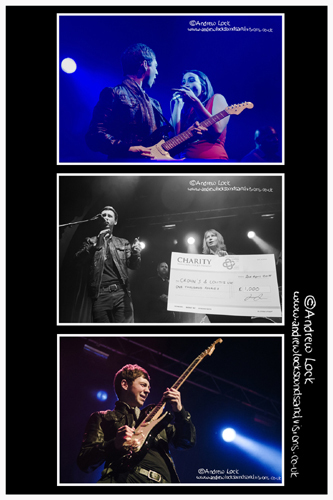 This was the best yet I have seen of blues maestro Laurence Jones, the combination of a busy hometown gig, new material to show off and a chance for him to raise money for a charity very personal to the young man himself - “Crohns & Colitis UK Organisation” all had a positive effect on this outstanding performance. Another local musical talent Shanade opened the show, and this first time out for her latest band very much impressed, her rich, powerful vocals and material for me with a touch of that classic Janis Joplin late 60’s soulful, blues rock touch went down well and great to see skilled blues guitarist Chris Gibbons in her band. Laurence himself played a blinder and looked even more energized and up for it than usual (which is saying something!) with plenty on offer from the new album, older favorites, scorching covers and a special guest all making for one hell of a night. The night also included a raffle to add to the money raised and a presentation of a cheque to the charity itself, Laurence also announced that the £1000 target for the night was reached, but more than that bettered. Fantastic night for Laurence, the charity and for the local area which as this gig proved musically has so much to offer.